Whether your stay is for study, business or pleasure, SunRe8 is your solution for comfortable, convenient and gracious short-term accommodation in Milan, Italy for up to two persons. 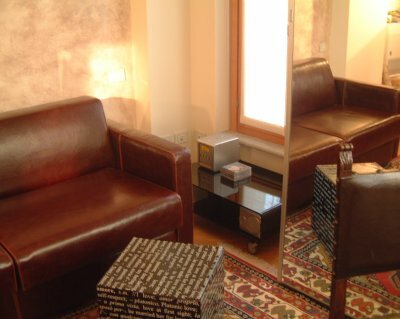 This luxurious, fully appointed bed and breakfast / self-catering studio apartment is conveniently located in Milan 500 meters from the principal Red metro line (MM1), near Piazza Loreto and just a short stroll from a pharmacy, grocery store and shops. Situated in a beautifully restructured 16th century convent on the strolling path that borders the famous Martesana Canal, guests of SunRe8 enjoy not only scenic ambiance but also the vibrant night-life of the canal including restaurants, cafés and the famous Zelig Cabaret Theatre. The studio apartment sleeps 2 and features a complete kitchen with dishwasher; flat-screen LCD television; high-speed broadband Internet connection and stocked "minibar" including wine and mineral water. For the included breakfast, choose between American style (a stocked kitchen) or Italian style with a SunRe8 voucher accepted at the café next door! Each weekly stay includes one room cleaning with change of sheets and towels. *Minimum stay: 3 nights. Prices will vary according to high/low season.